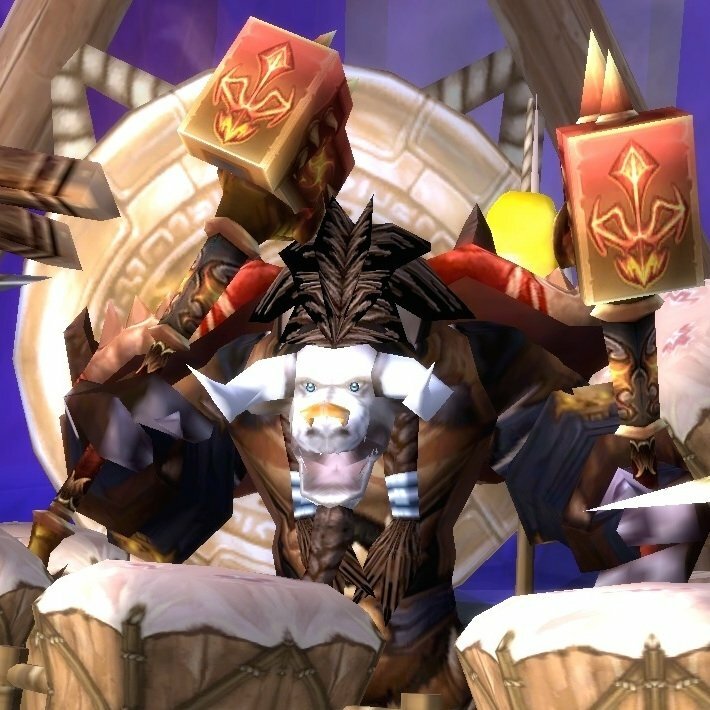 You'll never miss a performance of the Elite Tauren Chieftains! Wherever they are playing you'll receive advice on how to travel to them and when to expect a show. You'll be Terran Up the Night and Raise Some Hell come Nightfall or I am Murloc! Best Quest Elite Tauren Chieftains pushes the T rating way beyond G with ample flatulence jokes for all ages! Perfect as you blast around Azeroth in search of your hard rock heroes. This AddOn by itself does nothing. 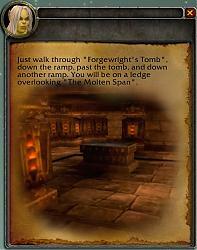 This AddOn requires the Best Quest "engine" to drive this module. Instal this AddOn like any other AddOn. Instal the Best Quest engine like any other AddOn. Use the installer provided by this webpage if you really must. Best Quest Elite Tauren Chieftains is NOT intended for players who play seriously. Bye! Introducing Kar'ilda, the flatulent orc. She will guide you as you scour the fields of Azeroth, hunting for the ETC! Not only does she bring her digestive woes to the fore, she is also an excellent guide for she has the scars to prove it. You will meet Kar'ilda at or near Shattrath, at or in the Black Mountain & Blackrock Depths, at or near Silvermoon City, and if the Darkmoon Faire is on. 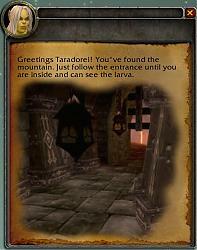 Kar'lda doesn't waste her time so each time she speaks it is once and once only for that aspect of your adventure. Forgive her as she swoons at the sight of Bergerrist (her crush), whoops for joy as the band buff her hard, or her business like approach to getting you though Blackrock Depths as quickly as possible. And forgive her veritable volleys of vastly vile vaporous visitations as it is surely the fault of that foul Durotar boar meat... or perhaps those dodgy monstrous Kaliri eggs she so craves. Sure, she needs the occasional chest wax but deep down, if you don't suffocate, she is all too eager to help you. Beware: she gives her advice once and once only! Oh, by the way... Kar'ilda doesn't know much about "servers" and "time zones" but suffice to say, every USA, Oceanic, Central American and Brazilian server's "local" time, whether "summer" or "standard" has been coded and some magic worked to ensure that the time of the ETC concert in the Grim Guzzler is as per your in game time (the time under your mini-map). Of course, Blackrock Depths is an instance so Blizzard could have moved you out of your usual world realm. Sigh. I can't code around that! 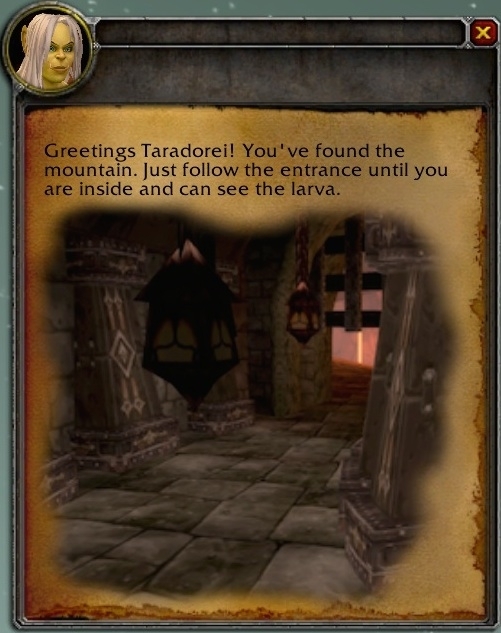 Kar'ilda has informed Taraezor that in the future she'd like to provide ongoing support to fans of the ETC. Until then, you will speak with her just the once for each aspect of the ETC experience that she covers. Included with the AddOn are lots of lovely textures used as a backdrop for the popup dialogue frames. Every time Kar'ilda speaks, her frame will be illustrated with a different view of the area near where you are exploring or perhaps even an action shot of a band member in action! All lovingly created by Taraezor! Many different flatulent sounds have been sourced from the masters of flatulence sound FX - Blizzard's own game files! All tenderly curated by Taraezor himself! Why not make Best Quest Elite Tauren Chieftains a Favourite and/or use Minion? * Reviewed and redid Detention Block and Grim Guzzler text. * Shattrath timings now known so added in: 2pm, 6pm, etc, and activated the dormant code. I have coded (I guess) over 200 servers for USA, Oceanic, Brazil, and Central America into the AddOn, along with summer and standard start and end dates. This so that the exact time of the Grim Guzzler performance can be presented to you. This was a lot of work (obviously). It is because Blizzard time the concert as 8pm Pacific Time. Support for the known Shattrath ETC schedule. AND a nasty calendar bug fix. Heck I wish I could use some of the other stuff the ETC have done but I'd breach copyright I suspect. Grim Guzzler schedule is known. Sticking point is that it is PST/PDT (California) server time dependant and everybody in any other part of the world is offset from that. Last edited by Taraezor : 07-25-15 at 05:34 PM.